The candidate should hold a bachelor’s degree in pharmacy (4 years after 10+2, including lateral entry students) or equivalent from a recognized university. Candidates appearing for the final year of bachelor’s degree B. Pharmacy (10+2+4) whose results will be announced before the commencement of entrance for the academic year 2019-20 may also apply for GPAT – 2019 computer-based test (CBT). Note: B.Tech. (Pharmaceutical and Fine Chemical Technology)/ equivalent candidates are not eligible to apply. For admission to a participating institute, please see the reservations applicable in that particular institute. In case of institutes run by Central Government, 15% of the seats are reserved for the category Scheduled Caste (SC), 7.5% for the category Scheduled Tribe (ST) and 27% for the category Other Backward Classes belonging to the “Non-Creamy Layer” (OBC – NCL). Each category will have 5% reservations for Persons with Disabilities (PWD) as defined in The Rights of Persons with Disabilities Act, 2016 (RPwD Act 2016). Other Backward Classes – Non-Creamy Layer (OBC – NCL) are as per the Central list of Other Backward Classes available on National Commission for Backward Classes (NCBC), Government of India website www.ncbc.nic.in. Thus, the candidates falling in this list may mention OBC in the Category Column. State list OBC Candidates who are not in OBC-NCL (Central List) must choose General. of the examination. Candidates shall not be permitted to enter in the Examination Hall/Room after 01:30 p.m. Step 1: Register for Online Application Form and note down system generated Application Number. The candidate should supply all the details while filling the Online Application Form and is also required to create PASSWORD and choose Security Question and enter his/her Answer. After successful submission of the personal details, the Application number will be generated and it will be used to complete the remaining Steps of the Application Form and will also be required for all future correspondence. For subsequent logins, the candidate will be able to login directly with the respective system generated Application Number and created Password. Step 2: Complete the Application Form Candidate can log in with the system generated Application Number and created Password for completing the Application Form. Step 3: Upload Scanned Images of Candidate Photograph and Candidate Signature: Scanned photograph and signature should be in JPG/JPEG format. Size of the scanned photograph should be between 10 kb to 200 kb.1. Size of the scanned signature should be between 4 kb to 30 kb. The photograph should be colored or black/white (but clear contrast).Note: Upload the correct Photograph and Signature as the facility for correction in images will not be given. payment, the candidate will be able to print the Confirmation Page. In case the Confirmation Page is not generated after payment of fee then the transaction is canceled and the amount will be refunded to the candidate’s account. However, the candidate has to make another transaction, in case the Confirmation Page is not generated. The medium of Question Paper shall be in English only. GPAT is an online computer-based test of 3 hours duration with 125 objective type questions. There are 4 marks for a correct answer. There shall be negative marking for wrong answers, for each wrong answer 1 mark shall be deducted. At the test Centre, each candidate will be seated at a desk with a computer terminal and he/she will be provided with rough papers for calculations and a PEN/PENCIL. After the test, the candidate must leave the rough papers at the desk. Rough work cannot be done on any other paper/sheet, as nothing will be allowed inside the examination room/hall. Note : Candidates are NOT allowed to carry Instrument/ Geometry/ Pencil box, Handbag, Purse, Any kind of Paper/ Stationery/ Textual material (printed or written material), Eatables and Water (loose or packed), Mobile Phone/ Ear Phone/ Microphone/ Pager, Calculator, Camera, Tape Recorder, any metallic item or electronic gadgets etc. in the examination Room/ Hall. Diabetic students will be allowed to carry eatables like sugar tablets/fruits (like banana/apple/orange) and transparent water bottle to the examination hall. However, they will not be allowed to carry packed foods like chocolate/candy/sandwich etc. The result will be compiled on the basis of final answer keys. No grievance with regard to answering key(s) after the declaration of result of GPAT – 2019 will be entertained. The raw (actual) marks obtained by a candidate will be considered further for computation of the result of GPAT-2019. No scorecard will be dispatched to the candidates and the candidates are advised to download their scorecards from the website:www.ntagpat.nic.in only. There shall be no provision for re-valuation/re-checking of the Score. No correspondence in this regard shall be entertained. The GPAT score card will be valid for three years. 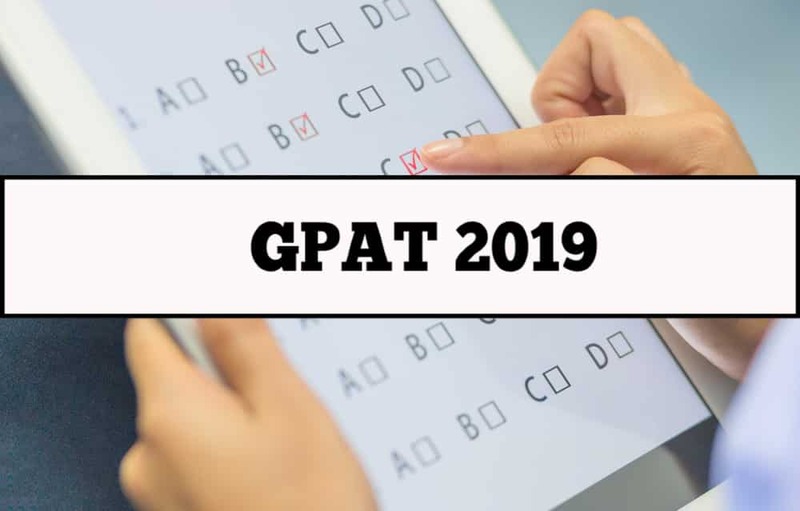 Keywords: GPAT 2019 Exam, GPAT 2019 Online Application, GPAT 2019 Application, GPAT 2019 Eligibility, GPAT 2019 Exam Details, GPAT Exam for Pharma students, GPAT Pharma Exam, GPAT Exam. GPAT Score Card validity, GPAT Exam Details, GPAT EXAM full details, GPAT 2019, Pharma competitive exam GPAT.